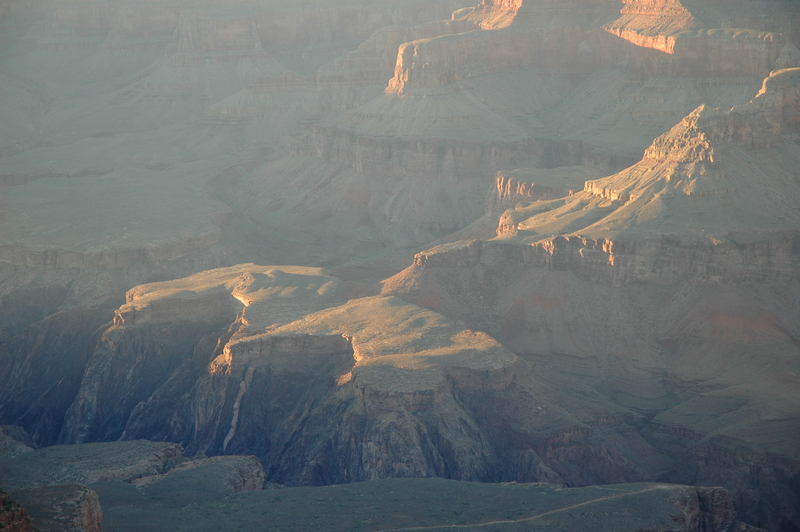 GRAND CANYON NATIONAL PARK, AZ – It sneaks up on you. This huge gash in the Earth’s crust doesn’t loom on the horizon, as would a mountain range; and it doesn’t make any noise to warn you of its presence, as does the ocean surf or a huge waterfall. I hides on the edge of a high wooded plain in the American southwest, until it almost jumps out and strikes you like a rattlesnake curled under a bush. Walking toward the edge of the Canyon of canyons, you get glimpses of it through the trees from the parking areas and between buses of tourist groups. But, those are just hints. Maybe, you arrive at the Grand Canyon Village, where you plan to stay at the one of the several accommodations operated by Xantera Parks & Resorts, like the grand dame of Western National Park Lodges: the El Tovar Hotel, perched on the edge of the South Rim. The El Tovar was built in 1905 and remodeled in 2005, it is a classic rock and wood 78-room gem with a sweeping view of the canyon from it’s dining room and back balcony. I recommend the Prickly Pear Cactus Margarita in the late afternoon, after one of your long hikes! Also at the Village is the Bright Angel Lodge and Cabins, designed by famous architect Mary E. J. Colter in 1935. There, you can enjoy a refreshing ice cream at the Parlor or check in for the famous Grand Canyon Mule Rides down the Bright Angel Trail. You can also try the Kachina Lodge or the Thunderbird Lodge, which remind me of a 1960’s dormitory or motel arrangement squeezed between the El Tovar and the Bright Angel Lodge, but I wouldn’t recommend them. Two other lodges are operated at the South Rim, but about one-half mile away tucked in the Piñon, Juniper and Ponderosa Pine Forests: the Maswik and Yavapai Lodges. It’s busy in the Village, people scurrying here and there, children underfoot, tourist groups shuffling for posed photos on the edge of the Rim before they jump back in their buses. 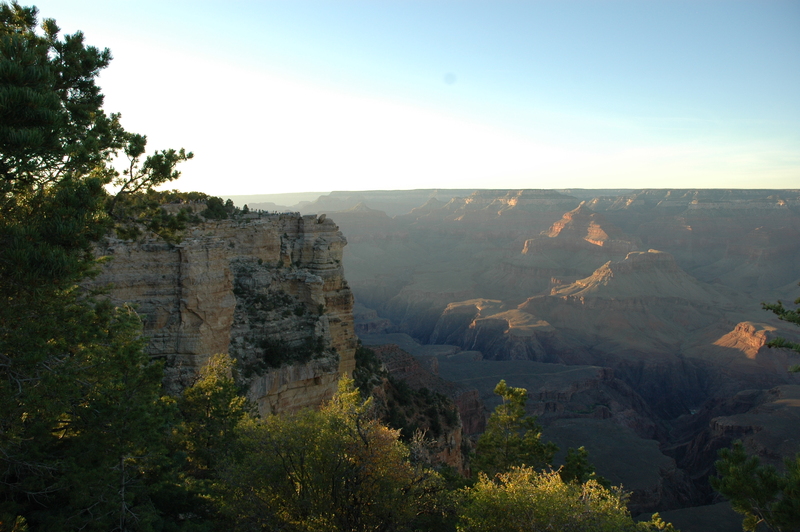 Walk along the South Rim Trail to the right, and find some quiet vista that’s all yours! We stayed in Tusayan, a small town just outside the Park boundary. The Red Feather Lodge was just fine for us, and it featured an early free breakfast before the sun rose, so we could get out to the trailhead and beat the crowds. Tusayan also has the National Geographic Visitors Center and an IMAX Theater, with a beautiful presentation of the Grand Canyon Experience, which sounds camp…but is beautifully made and highly recommended. 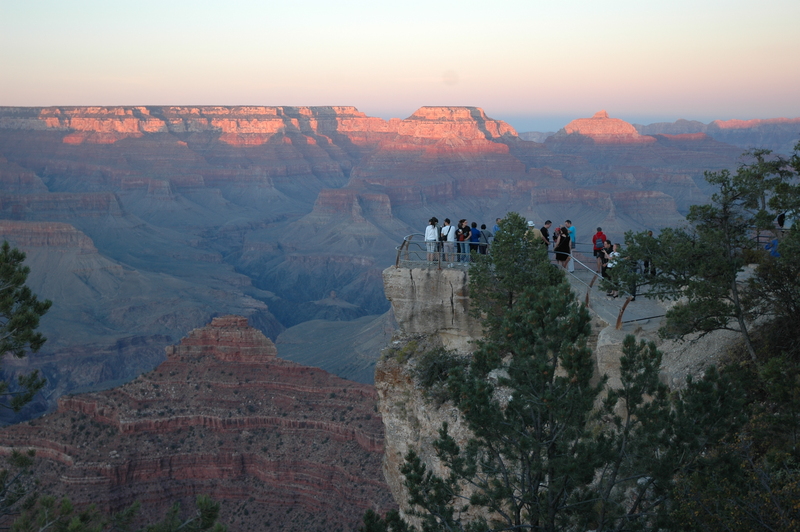 See it before or after you see the Canyon and it helps you grasp the magnitude and grandeur of the place. So, the plan was to take two major hikes over the three days, both into the Canyon and down as far as we could reasonably get before turning back to climb back up to the South Rim. That first evening we arrived from Phoenix Sky Harbor Airport via Flagstaff, after checking into the Red Feather Lodge in Tusayan and driving to Grand Canyon Village, was spent walking to Mather Point and then along the Rim Trail to the east in order to get away from the tour groups and buses. It allowed us to get acclimated to the altitude along the Rim – from 6,900 to 7,100 feet above seal level. What astonishing views greeted us from Mather Point and the Rim Trail as the sun set and the long-angled rays caught the far side of the Canyon! Tomorrow, the International National History League (INHL) will tackle the first real hiking challenge: The South Kaibab Trail to Skeleton Point, overlooking the Inner Canyon and the Colorado River far below! This trek will cover approximately 7 miles roundtrip, dropping off the rim at the South Kaibab Trailhead (which is 4.5 miles east of Grand Canyon Village) off of Yaki Point Road, and dropping over 2,040 feet into the giant Canyon below. It should take us 6 or 7 hours and will be a good run-up to the next-day’s big hike on the Bright Angel Trail. ~ by Dave Etzold on July 23, 2010.